As a fundamental dimension of creaturely existence, “time” or temporality distinguishes the cosmos in a decisive way from its Creator. While fallen man is tempted to find his alienation from the immutable peace of divine eternity reflected in time’s passage, the authors included here recall that time flows originally from the creature’s participation in God’s life. Rather than a sign of the creature’s non-reality before God, these authors attest, time instead belongs to the goodness of finite being and its ultimate destiny in God. 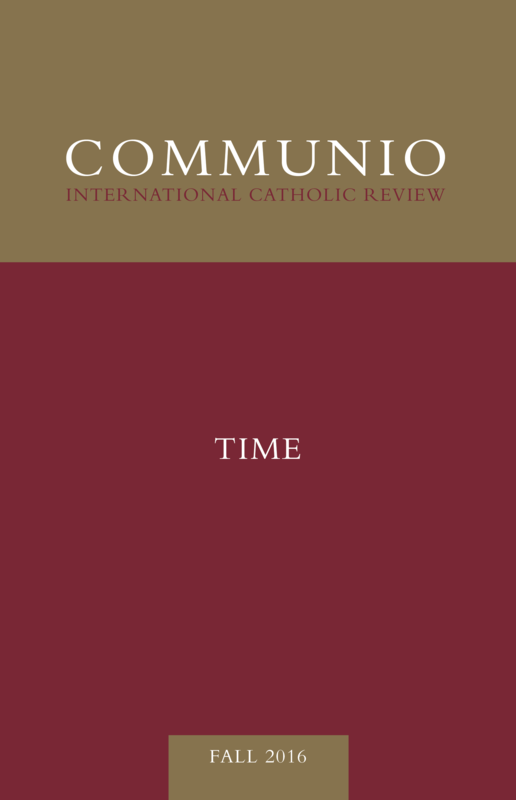 In “The Consummation of the World as a Re-capitulation,” Martin Bieler considers temporality as the structure according to which human freedom develops towards perfect intimacy with God. “The gift of time is of the same value as the granting of contingency, without which there is no implementation of freedom, without which there can be no life.” Time, Bieler affirms, arises from the communication of being, through which man is called and freed to answer the all-encompassing Love that wholly supports his action. In this way, man’s linear path forward is meant to lead him more deeply into his eternal Origin. As such, creaturely movement and the time of human living is inwardly open to its recapitulation in Christ, through whom time is raised into the trinitarian exchange of love. In “The Experience of the Unity of Time and Christian Faith in the Thought of Ferdinand Ulrich,” Ricardo Aldana explains how, for Ulrich, the present is best understood in light of the human person’s thanksgiving for having received being and his secure hope in God’s continual gift of being. As Aldana shows, faithful memory of one’s origin in God, for which one is set free by the grace of Christ, is indissoluble from the “forgetfulness” of loving abandonment to the providential gift of the future. In Retrieving the Tradition, we first present two excerpts from works by Ferdinand Ulrich. In the first selection, “Giving Time: The Trinitarian Origin of Created Spatio-Temporality,” Ulrich contemplates the mystery of divine patience. According to Ulrich, temporality is ultimately an expression of God’s hopeful entrustment of freedom to the creature, an abiding hope whose presence sustains the human person’s loving response and liberates the sinner’s return to love. “Given time is the epiphany of [God’s] patience of mercy. Not empty, arbitrary time, but the time of love.” The second piece, “‘Once upon a Time’: Preserving the Past in a Presence Open to the Future,” involves a meditation on freedom’s living relation to its ontological past. By gratefully affirming now that he has already received being and that he continues to live out of this gift, the human person is opened up to the ongoing promise that he will continue to exist, and is thereby free to actively dwell in the present. Also in Retrieving the Tradition, Louis Bouyer’s “The Mystery of the Liturgical Year: The Easter Liturgy” ponders the relationship between the sacramental commemoration of Jesus Christ in the Mass and the gradual unfolding of Christ’s life across the cycle of the liturgical year. “In the Feasts, as in everything else in the Church, it is the Eucharist which makes actual the presence of the Mystery. But the celebration of the various Feasts, in connection with the Eucharist, brings about a development of the Mystery in us.” According to Bouyer, participation in the liturgical calendar’s rhythms fulfills and transfigures the natural shape of human life in time, including its inner orientation towards death, in light of the crucifixion, Resurrection, and eschatological parousia of Christ.